Need new jeans? How about jeans for FREE after Kmart Shop Your Way Points? 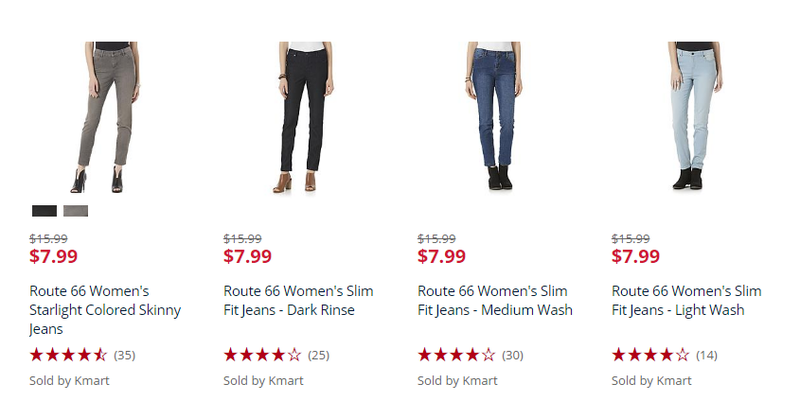 Kmart is offering $10 in Shop Your Way Points for every pair of Women's Route 66 Jeans you purchase (up to $50 in rewards, or for 5 pairs of jeans). Even sweeter, some of these jeans are only $7.99, making them BETTER than FREE after points! Now through 1/28/2017, you can earn $10 back in points on every pair of Women's Route 66 Denim sold by Kmart. Cap of 50,000 points per members. Offer valid for Shop Your Way Members only. If you're not a Shop Your Way member, sign up for free HERE. Final cost: Free plus a $8 moneymaker! I also had a Kmart coupon for $5 off $50 and $5 off $30 in toys, so I added some LEGOS to my order (Christmas gifts) and was able to use both coupons, taking another $10 off my total! These get great reviews too, so I'm excited to try them out! Finally, if you're shopping online, always start at Top Cash Back-- you may as well earn some cash back in your account. They are offering 4% cash back at Kmart!